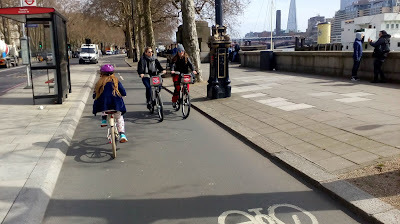 After the long slog of winter, it was a joy to be able to cycle further than my usual commute this week and in the sunshine. 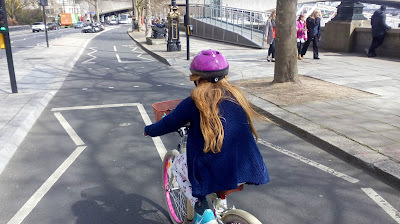 It was even more of a joy to be cycling with my older daughter on what was her longest trip since learning to ride a couple of years back. 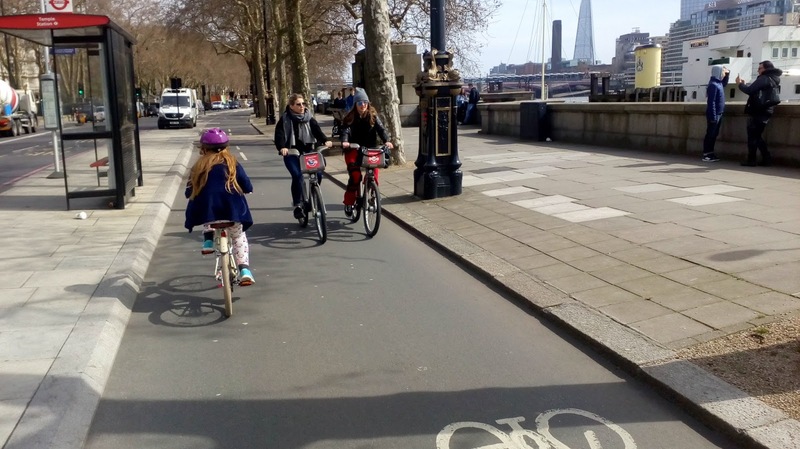 Round our way, cycling in safety is in short supply. Perversely, it is easier to get to the retail park than the local shops because the former has a cycle track passing it, whereas the latter is mixing with poor driving along heavily-parked streets. So, for a cycling day out we have to travel further into London and that either means taking the bikes on the train or in the car. 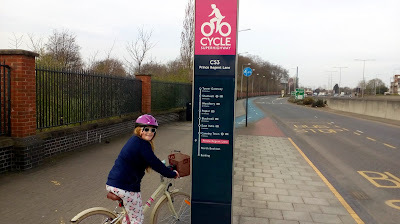 We chose the latter which meant we could start at Barking and cycle right into Town via CS3. If you're interested in the section built before the wonderful Central London section, you can read about it here. Nothing has changed on this section and sadly, the development works ongoing around Canning Town and Canary Wharf hasn't changed the road layout at all. Still shared crossings or giving way to traffic. Our intention was to cycle to the headquarters of the Institution of Civil Engineers at Great George Street in Westminster to go and see their Invisible Superheroes exhibition, although in the event, we had to park on CS3 by Westminster Bridge and walk because of the complete absence of cycle parking in the area around the ICE, despite there being plenty of space in the area - a really poor show from Westminster City Council. 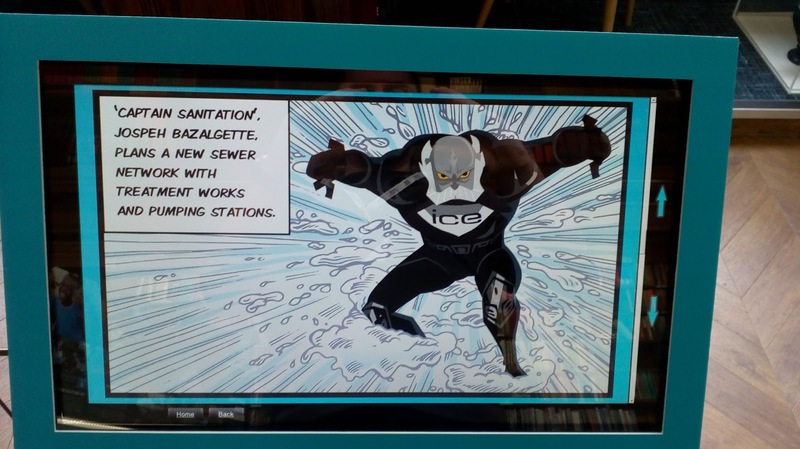 The exhibition is part of the ICE's 200th anniversary and even if you haven't got children, it is worth a visit if you are in the area during the week. It a bit of fun seeing my own civil engineering hero, Sir Joseph Bazalgette, getting the superhero treatment and rather fitting that his Embankment scheme now allows people to cycle in safety along the Thames! 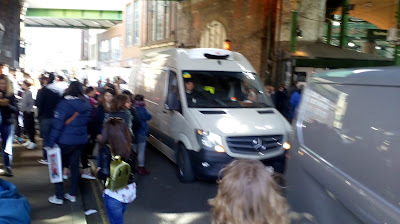 We also managed to fit in lunch at Borough Market which was heaving with people as usual (my favourite time is 8am on a Saturday); and as usual, there were the usual drivers pushing through the crowds. 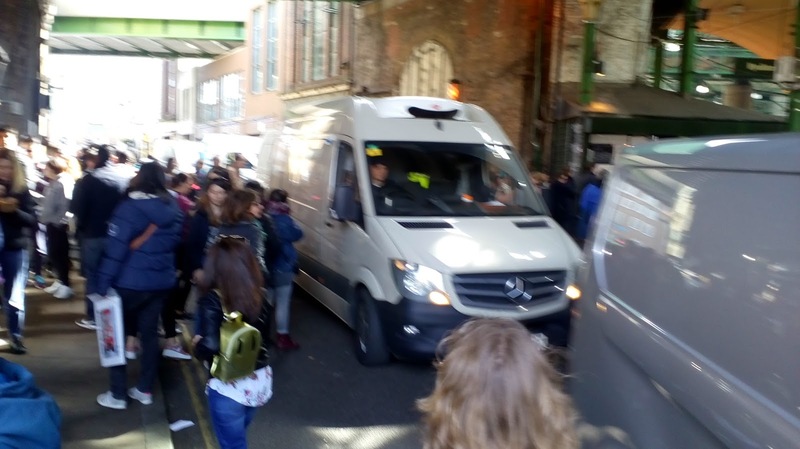 If there ever was a place which needs to be a pedestrian zone during the day, then this is it. 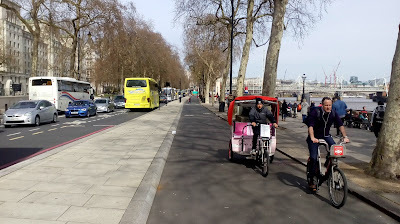 But away from the crowds, we had the freedom of CS3. 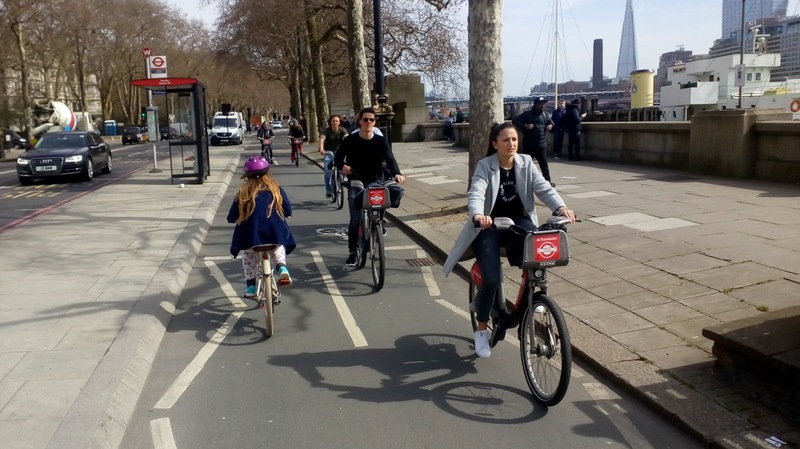 Despite what some would have you believe, it performs a vital off-peak transport function for those who work outside of the 9 to 5 norm, as well as being a great way to see some of the city sights. With children, this sort of trip was impossible before it was built. It is a theme that I am constantly repeating, especially those who go on about such infrastructure being only used in the peak times. It is true that transport generally is used most at peak times - that is why they are called peak times. For cycling, if the infrastructure is not available off-peak, then it is never going to be inclusive or enabling. So be honest, you just hate the idea of kids being able to have a day out under their own steam.